Now at Hartford Truck – the best in truck and commercial van ladder racks, van equipment, and van shelving accessories. We offer streamlined styling without compromising strength or security. Materials like T-6 aircraft aluminum, heat treated steel, swagged joints, and polyester marine-grade powder coating keep our products strong, durable, and long-lasting. We offer our customers many options to meet your needs. DuraMag® leads the way in the highest quality, safest design for service bodies. DuraMag® Service Bodies are built from heavy wall-extruded aluminum with floors that are a heavy, interlocking extrusion, not sheet. The bodies are made to last the life of the truck and come with an unsurpassed 10 Year Limited Warranty. The next generation of the XLS™ expandable wing snow plows delivers a whole new level of versatility, efficiency and performance. The only expandable plow with independent wing control and trip-edge protection, the XLS plows now come with flared wings and are available in two blade sizes: 8′-10′ and 8′ 6″-11′. Built bigger and stronger to carry more snow and accommodate larger trucks. Maximize handling and capacity with unmatched windrowing productivity so you can do what you do even more efficiently. Fisher spreaders come in the low-maintenance, rust-resistant stainless steel (Steel-Caster) and corrosion resistant double-walled poly hopper (Poly-Caster). Both come with dual electric motors, 16.5″ conveyor chain, convenient plug-n-play accessory hub, top screen, and variable speed controllers. New & Used Pickup Truck Bodies, Tailgates, & Bumpers Available. Many Makes, Models and Colors to Choose From. Reading aluminum service vans for the Ford Transit and RAM Promaster are all aluminum construction and up to 50% lighter than the comparable steel version. The CSV comes loaded with exclusive Reading features, including acrylic E-Coat primer, Dual-Pro® door seals, patented hidden hinges and stainless steel locks with paddle handles, and are available in 57” & 72” heights. 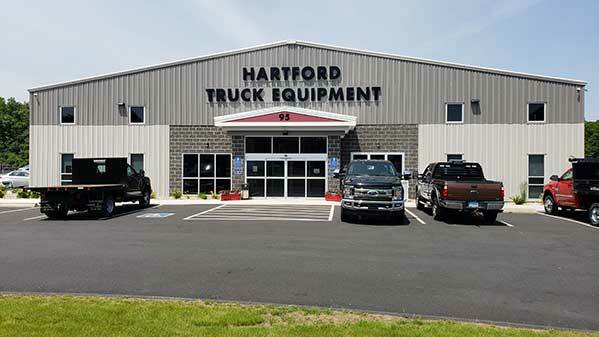 Hartford Truck Equipment has the largest inventory in the area. Hartford Truck Equipment is Connecticut’s premier work truck up-fitter and your connection for all your work truck and accessory needs. Whether it’s a dump, utility, platform body or a plow, sander and emergency lights, Hartford Truck has the largest inventory in the area. Need additional information on any of the quality products sold and serviced by Hartford Truck Equipment? Just browse our website for details from the world’s best equipment manufacturers. Call or email Hartford Truck Equipment today and talk to a factory trained professional. Personalized attention is what you get. Custom accessories can be added to suit your needs. Commercial or residential, Hartford Truck Equipment has the quality brands you deserve.